Railpictures.ca - Doug Page, Bruce Acheson collection Photo: 1967 was a good year for train watching in southern Ontario. Not only was it Centennial year with its extra passenger traffic, we had a new commuter service into Toronto (the now well-established GO Transit), new locomotives (C424s, GP40s and SD40s on CN; SD40s and C424s delivered in 1966 on CP); the “last hurrah” for older MLW and CLC locomotives on CN before retirement; the last full year of NYC operations in Canada; the final year before adoption of the CP Rail paint scheme; 6218 excursions; and leased locomotives! For much of 1967, CN leased several N&W F7As and used them between Toronto, Fort Erie, Windsor, and Sarnia, sometimes in N&W only consists and sometimes mixed in with CN power. (There is even one known case of an N&W F7A-Ontario Northland FP7 combination!) Here we see an eastbound train working Hamilton with a pair of N&W F7As and a pair of CN GP9s. “Those were the days, my friend!” | Railpictures.ca – Canadian Railway Photography – photographie ferroviaire Canadienne. Caption: 1967 was a good year for train watching in southern Ontario. Not only was it Centennial year with its extra passenger traffic, we had a new commuter service into Toronto (the now well-established GO Transit), new locomotives (C424s, GP40s and SD40s on CN; SD40s and C424s delivered in 1966 on CP); the "last hurrah" for older MLW and CLC locomotives on CN before retirement; the last full year of NYC operations in Canada; the final year before adoption of the CP Rail paint scheme; 6218 excursions; and leased locomotives! For much of 1967, CN leased several N&W F7As and used them between Toronto, Fort Erie, Windsor, and Sarnia, sometimes in N&W only consists and sometimes mixed in with CN power. (There is even one known case of an N&W F7A-Ontario Northland FP7 combination!) Here we see an eastbound train working Hamilton with a pair of N&W F7As and a pair of CN GP9s. "Those were the days, my friend!" Thanks for the additional info, Bruce! In my notes this is train 466 (Ft Erie-Toronto) on March 12/67, 3666-3658-4598-4573. 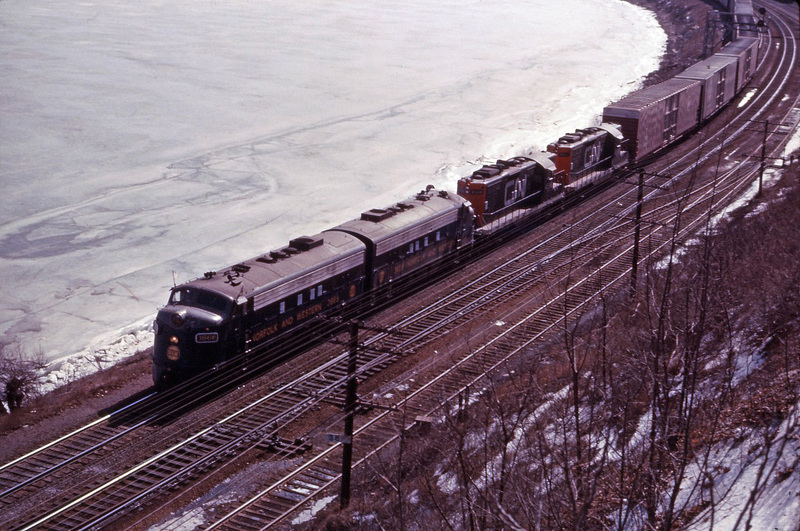 The N&W F7′s were leased from March to August, 1967. The totals would vary now & then but I believe it was never more than 5 at once. 3666 and 3658 were the first pair, and they were not seen again after mid-June, replaced by others. The ONR + N&W combo happened at least three times. That is to say, I personally witnessed 3 different events, but none of those ever involved the Northland passenger train ! When N&W’s were on lease they were always kept west of Toronto. June 10/67 – Windsor-Toronto train 478, 4581- N&W 3658- ONR RS3 1306 – CN (exL&PS) 991, 992. June 20/67 – Ft Erie-Toronto ore empties train 450 – ONR 1520 – N&W 3671. They were turned around immediately and made a Nia Falls turn on 461/462, coming east the morning of June 21. The morning of Jun 23/67 we found N&W 3658 at Ft Erie shop in MU with CN RS18 3626 and ONR GP9 1603-F7 1508. It’s believed they had arrived that morning with the Aliquippa ore train, 449 from Toronto. Please, someone find a shot of that N&W F7 on the Northland! Seriously, imagine that sitting in Cochrane or Kapuskasing.